Figure 12-1. Composition of the atmosphere. The first layer, known as the troposphere, extends from 6 to 20 kilometers (km) (4 to 12 miles) over the northern and southern poles and up to 48,000 feet (14.5 km) over the equatorial regions. The vast majority of weather, clouds, storms, and temperature variances occur within this first layer of the atmosphere. 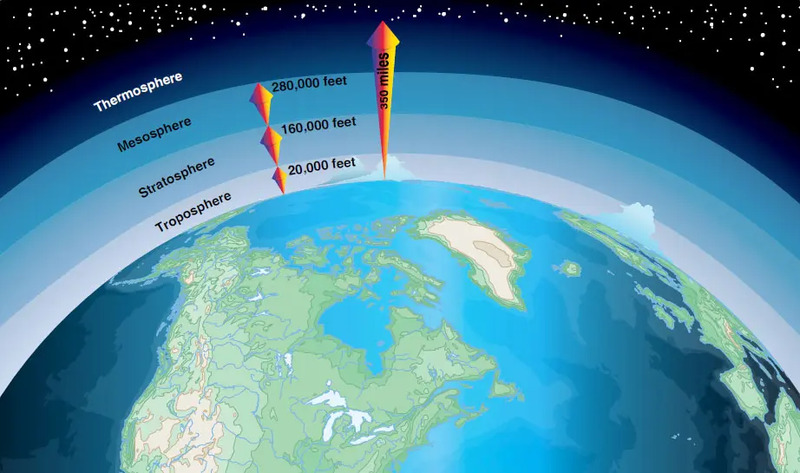 Inside the troposphere, the average temperature decreases at a rate of about 2 °Celsius (C) every 1,000 feet of altitude gain, and the pressure decreases at a rate of about one inch per 1,000 feet of altitude gain. At the top of the troposphere is a boundary known as the tropopause, which traps moisture and the associated weather in the troposphere. The altitude of the tropopause varies with latitude and with the season of the year; therefore, it takes on an elliptical shape as opposed to round. Location of the tropopause is important because it is commonly associated with the location of the jet stream and possible clear air turbulence. Above the tropopause are three more atmospheric levels. The first is the stratosphere, which extends from the tropopause to a height of about 160,000 feet (50 km). Little weather exists in this layer and the air remains stable, although certain types of clouds occasionally extend in it. Above the stratosphere are the mesosphere and thermosphere, which have little influence over weather. Heating of the Earth’s surface is accomplished by several processes, but in the simple convection-only model used for this discussion, the Earth is warmed by energy radiating from the sun. The process causes a circular motion that results when warm air rises and is replaced by cooler air. Warm air rises because heat causes air molecules to spread apart. As the air expands, it becomes less dense and lighter than the surrounding air. As air cools, the molecules pack together more closely, becoming denser and heavier than warm air. 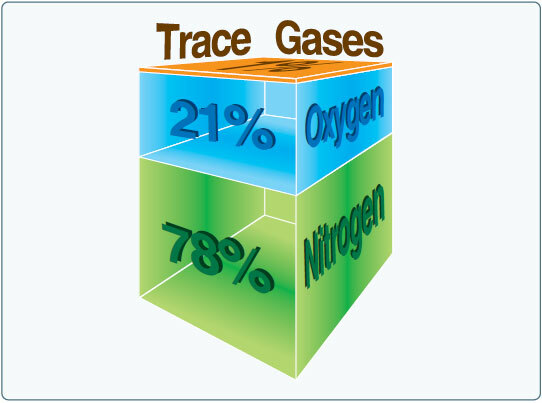 As a result, cool, heavy air tends to sink and replace warmer, rising air. Because the Earth has a curved surface that rotates on a tilted axis while orbiting the sun, the equatorial regions of the Earth receive a greater amount of heat from the sun than the polar regions. The amount of solar energy that heats the Earth depends on the time of year and the latitude of the specific region. All of these factors affect the length of time and the angle at which sunlight strikes the surface. Figure 12-3. Circulation pattern in a static environment. 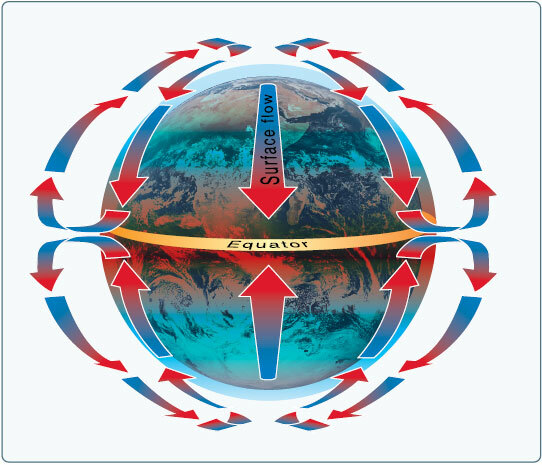 The unequal heating of the Earth’s surface not only modifies air density and creates circulation patterns; it also causes changes in air pressure or the force exerted by the weight of air molecules. Although air molecules are invisible, they still have weight and take up space. 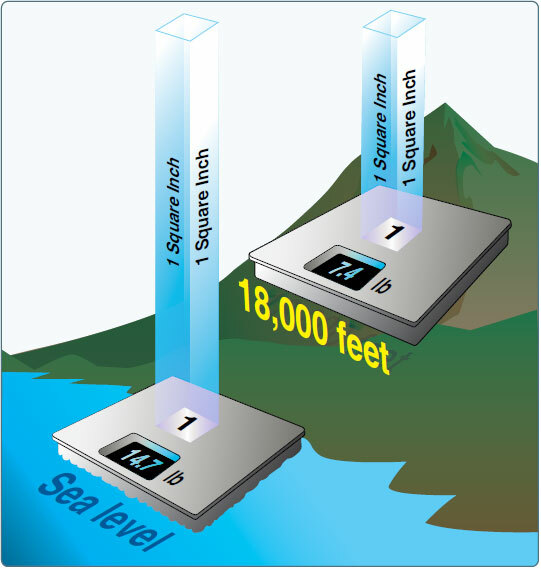 Imagine a sealed column of air that has a footprint of one square inch and is 350 miles high. It would take 14.7 pounds of effort to lift that column. This represents the air’s weight; if the column is shortened, the pressure exerted at the bottom (and its weight) would be less.